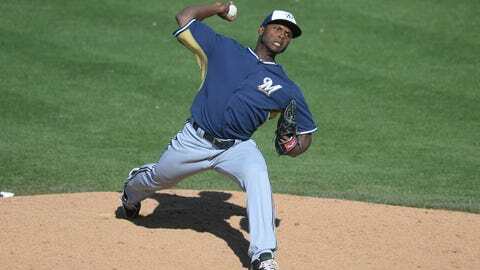 Alfredo Figaro had a 1.80 ERA in eight appearances this spring for the Brewers, but he'll start the 2014 campaign at Triple-A Nashville. The roster picture for the Milwaukee Brewers became a lot clearer Saturday night, as the team made a series of roster moves following its 9-6 exhibition loss to the Los Angeles Angels. Right-hander Alfredo Figaro and outfielder Caleb Gindl were optioned to Triple-A Nashville, while infielder Irving Falu and catcher Robinzon Diaz were returned to minor-league camp. Catcher Lucas May remains in big-league camp and will travel to Milwaukee for the two exhibition games but was told he won’t make the 25-man roster. Sending Figaro to Triple-A leaves Tyler Thornburg, Rob Wooten, Wei-Chung Wang and Zach Duke still in the mix for three open bullpen spots. Figaro had a 1.80 ERA in eight appearances this spring for the Brewers. He was focusing on developing his off-speed pitches to accompany his power fastball. He went 3-3 with a 4.14 ERA in 33 games and five starts with Milwaukee in 2013, making the team out of spring training as a non-roster invitee. The 29-year-old is in his final option year, meaning he can be bounced back and forth between the minor leagues all season long. Gindl was one of the victims of the Brewers keeping two first basemen and two second basemen on the roster. That allowed just one outfielder off the bench, which will be Logan Schafer. The 25-year-old received plenty of playing time this spring, hitting .229 with two home runs and nine RBI in 48 at-bats. Competing for the final bench spot, Falu performed well and hit .357 with an RBI in 28 at-bats. But incumbent Jeff Bianchi is hitting .400 and did nothing to lose his job.